But first, here’s one of me because I’m Miley Cyrus and I’m awesome. 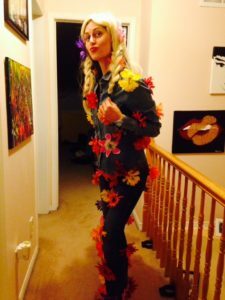 Three hours (and several thumb pricks) later, this costume was born. Safety pins aren’t THAT safe, y’all. I’m gonna talk like Miley ’cause I’m Miley. Johnny Cash was there! He agreed to pose with me like Adam Levine did in our promo shots on The Voice. 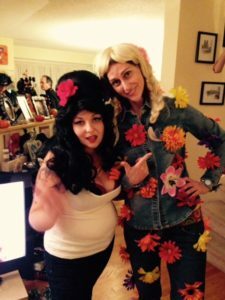 The ghost of Amy Winehouse was there! She was all, “Don’t even try to make me go to rehab!” And I was all, “Just look at the flowers, Amy. Focus on the peace and love.” We were both a little tipsy. 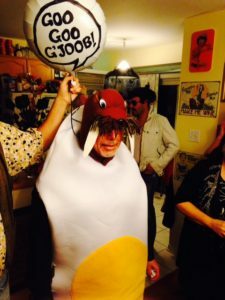 The Egg Man AND The Walrus was there! He’s also a gigolo in his spare time. 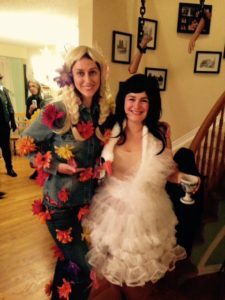 My biggest fangirl moment happened when I met Bjork! I told her I’ve always wanted to visit Iceland to tour the Phallological Museum. Bjork said, “I’m a fountain of blood in the shape of a girl.” She’s so deep, y’all. Once we were good and ready (and slightly sloshed), we made our way down the street to the Conroy Pub for karaoke! Everyone there was pretty stunned to see so many celebs walk in. I got an especially warm welcome from the ‘rokee people. They loved my ensemble. 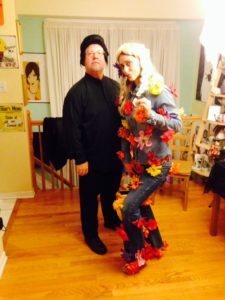 In fact, I even won best costume! I’ve never won best costume before! 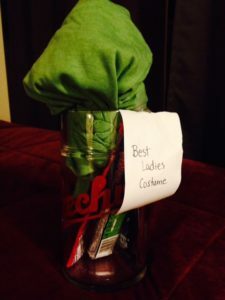 My prize was a super-fantastic beer mug stuffed with a green Conroy Pub t-shirt and all kinds of Halloween candy. Score! I’d like to thank the Academy, my momma, my daddy, God, silk flowers…. Kudos on the best costume! It was pretty sweet. Sounds like you had a fantabulous time! Wait, you were wearing a costume? That looks like something you’d wear normally. Just kidding. You look awesome. Hee! I might wear this getup more often. You know how I like the attention. 😉 Thanks, Mamalu! I’m fascinated by the severed arms hanging behind Bjork. Sounds like it was a fabulous time and you look amazing! No wonder you won! Previous post Weekend Writing Warriors #14! Next post Weekend Writing Warriors #15!